Skilled Pro Movers In Chicago • Chicago Maid Co. Working with professionals is very important when you’re moving. A team of expert moving specialists will make all the difference. So if you’re moving houses or switching places of business – call us, our offers go beyond cleaning solutions. Chicago residents and businesses trust us with their belongings because they know that we work with utter diligence and use only the best packing supplies. We prioritize on safety and this is why we utilize a large array of different item protection products in order to ensure the safe and timely delivery of the items that we are hired to haul from point A to point B. Large objects which cannot be dismantled or packed, we cover with specialized blankets which protect their surfaces from unwanted scratches, dents and marks. We have the manpower and vehicles to handle both short and long distance relocations. So, don’t be hesitant to contact us if you are moving from Aurora, Rockford, or Joliet to Chicago or from Chicago to the neighboring states of Iowa, Indiana, Missouri, Wisconsin or Kentucky, and vice versa. Our vans are equipped with the best and most accurate navigational systems while their cargo sections are fitted with high quality straps which keep the moved items in place and prevent transit related accidents. 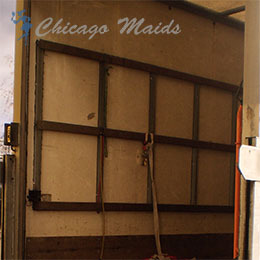 Keep in mind that Chicago Maids Co. has adopted the policy of cleaning and restocking our vehicles with protective gear after the completion of each relocation project for which we are hired. After all it is not by chance that we credited as one of the most qualified movers in Chicago. You can easily book our services as we work with a flexible calendar which always has free slots. It also permits us to accept same day bookings and to conduct late night moving, a feature of our company which is highly appreciated by both our private and business customers. We can be hired at any time of the day as we maintain a 24 hours support center. Know that we offer lucrative midweek and special discounts with the aid of which you can lower furthermore your relocation costs. You should also know that we are Chicago movers who work with free quotes which are final ergo no hidden fees and taxes once your move is over. Our moving company is seated in Chicago, Illinois. It is one of the North American’s largest and most important cities. Home to numerous international companies and high profile institutions, Chicago has become one of the United Stat’s most important culture, financial and touristic hubs.